The objective of Cross Country is as an endurance test where the horse and rider have to show speed, courage and jumping ability. In the past the sport used a ‘long format' which included four phases that had to be completed in a set time. Phase A was on a road or track. This warmed up the horse and was ridden at an energetic trot, allowing muscles to relax and loosen. Phase B was a steeplechase of six to eight jumps ridden at a strong gallop. Steeplechasing was similar to cross country thoroughbred racing and was said to be the result of a bet by a Mr O’Callaghan and a Mr Blake in 1752. The race was about 6 kilometres (4 miles) cross country from Buttevant Church to St Legers Church, in Ireland. In other words it was a race from one church steeple to another church steeple. The first Steeplechase over a prepared track was held in England in 1810. Unlike the Steeplechase phase in a Cross Country event, where horses race the clock not each other, Steeplechase races have a number of horses, called the ‘field’, that start at the same time and take the jumps together. Phase C was back to the road or trail. This was ridden at a relaxed trot with periods of walking to relax the horse and allow it to recover. Many riders would dismount and run beside their horses. At the end of this phase the horse and rider would enter the ‘Ten Minute Box' where the horse would be given time to recover. Cooling down and gear adjustment would be undertaken while a team of veterinarians would check the horses temperature, pulse, respiration and soundness. If all was OK the horse and rider would be allowed to move to the "Starting Box'. Phase D was the Cross Country section. The course is about 6 kilometres long with 24 to 36 obstacles. 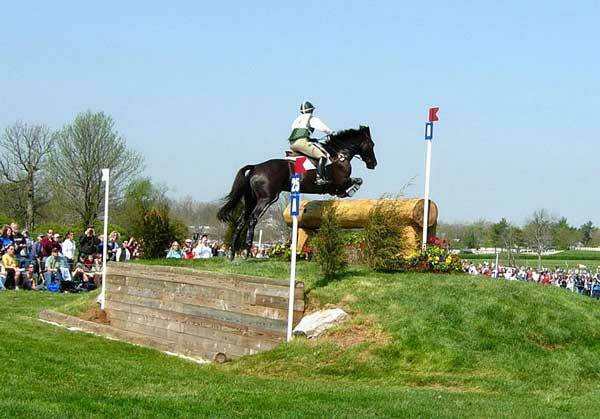 As part of an ‘Eventing' competition this long format Cross Country was last used at the Sydney Olympics in 2000 and at other major international competitions in 2005. Some lower level competitions in the US still use the long format however the short format, which only includes Phase D or cross country section has become the norm. 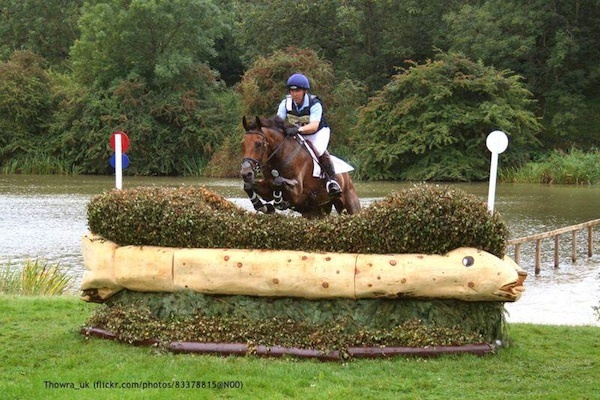 Cross Country elements are called obstacles or fences, rather than jumps. These obstacles are usually made of natural materials such as logs, trees, water, fences, banks and ditches and are meant to reproduce the obstacles that may be found during a ride across the countryside. 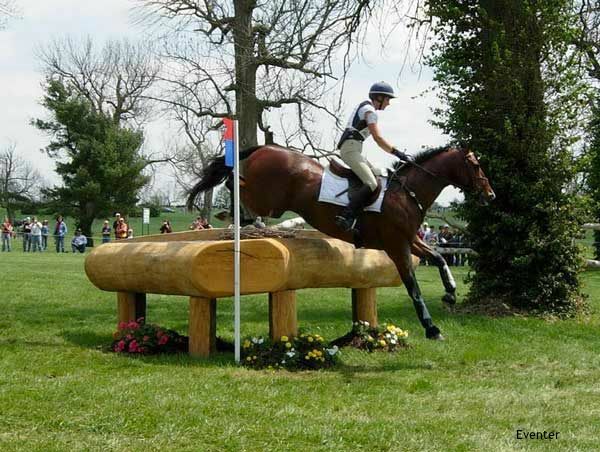 All the obstacles are solid unlike show jumps that are designed to fall if they are touched. Due to safety concerns, course designers are now making their obstacles ‘frangible', which means that they will release and come apart if put under reasonable pressure. Just like show jumping the lowest score wins, so everyone is trying to get the least number of penalties. 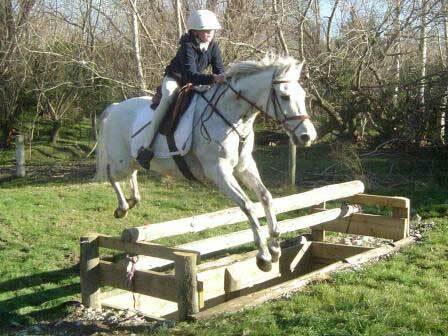 A horse refusing to jump or negotiate an obstacle will result in penalty points. Also going over the ‘optimum time' for that course will mean penalty points. You can be eliminated if you have: too many refusals, you jump obstacles in the wrong order or wrong direction, you miss a jump, you fall off or your horse falls. You can also be eliminated if you don't wear the right headgear, use the wrong saddlery, don't stop when signalled or your horse has his head and shoulders outside the flags. 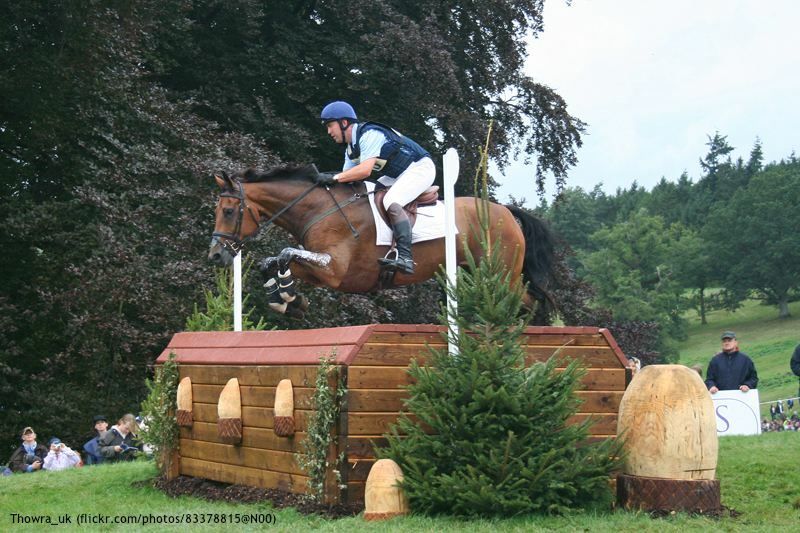 Any horse and rider combination can compete in cross country however for top level competition the most successful breeds seem to be Thoroughbreds, Thoroughbred crosses and lightly built Warmbloods. 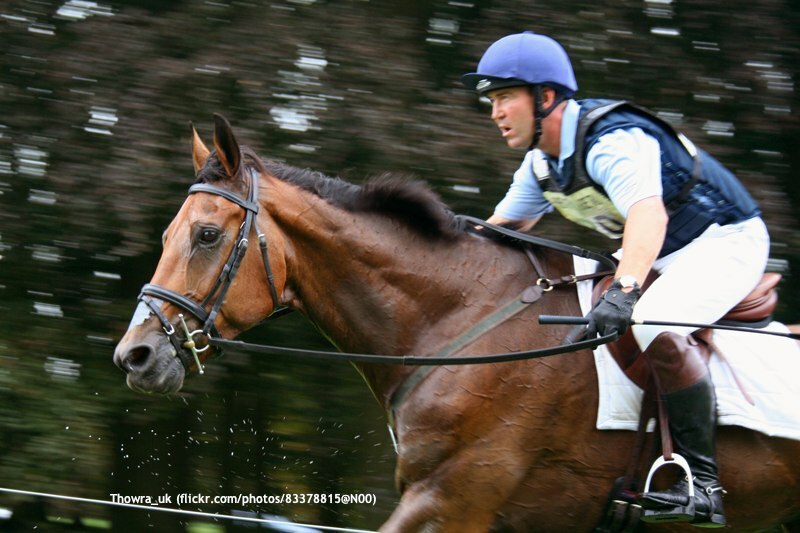 However athletic ability, courage and a sensible attitude are the key attributes for a Cross Country horse. In addition, a slightly higher knee action is an advantage over rough terrain, which means ‘Hunter’ types are also very popular. 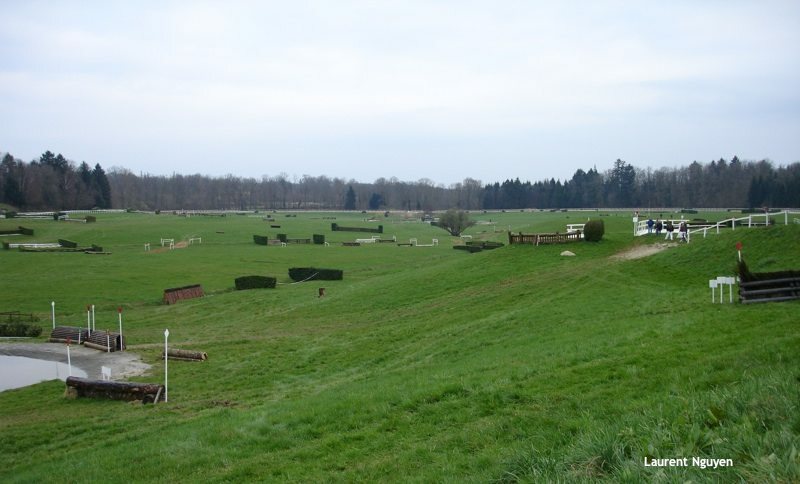 The main difference between Cross Country obstacles and showjumping jumps are banks, ditches and water. Also they are made from different materials, usually rustic things like logs, gates and stone. Their construction is solid and meant to represent the types of obstacles that a rider may encounter if they were riding across the countryside. Arrowhead (Chevron). These are a V shape with the point of the V pointing to the ground. These are very narrow, which test how much control the rider has over the horse as it is easy for the horse to duck out the side and avoid the obstacle. Brush Fence. The brush fence is similar to the steeplechase fence with a solid base and brush placed on top. The brush is low enough for the horse to see the other side and the horse is expected to jump through it rather than over it. Bullfinch. As with the Brush fence this fence has a solid base but the brush on top is a lot higher. The horse cannot see the landing on the other side, so trust in the rider and courage are required. 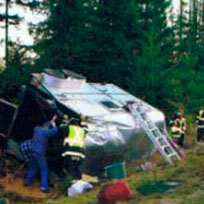 Again the horse is expected to go through the brush no over the top of it. Coffin. This is a combination fence consisting of a rail fence leading downhill to a ditch then uphill to another rail fence. 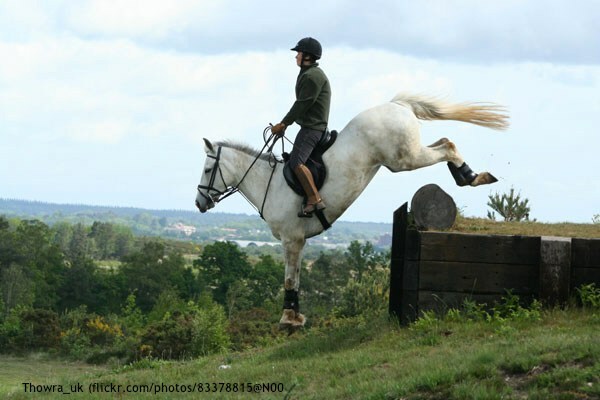 This obstacle must be taken at a slow canter called a ‘coffin canter' rather than a gallop. Combinations. 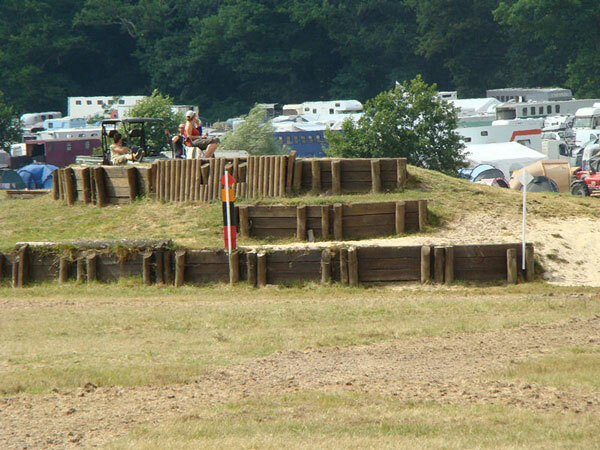 These can be made up of banks, logs, water or any other elements that the course designer has at his disposal. The main thing is that it is a number of obstacles that are positioned only a few strides apart and must be taken in the right order. Corner(Apex). This is a triangular shape placed horizontal to the ground. 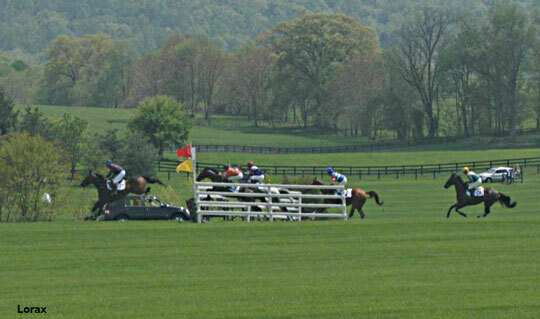 The fence should be jumped as close to the apex, or pointy end, as possible. 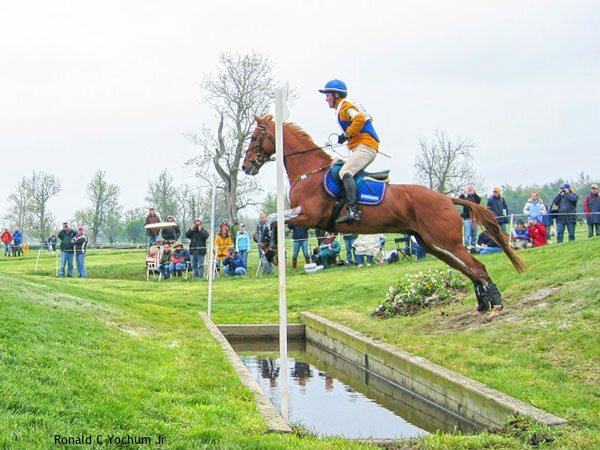 This is a difficult obstacle as the widest part of the V may not be possible for the horse to clear and too close to the apex makes it easy for the horse to duck out. Ditch. The ditch is a dug out area that can be nearly 12feet (3.7metres) wide. The horse must clear the ditch, which means a long powerful stride is required. Drop Fence. 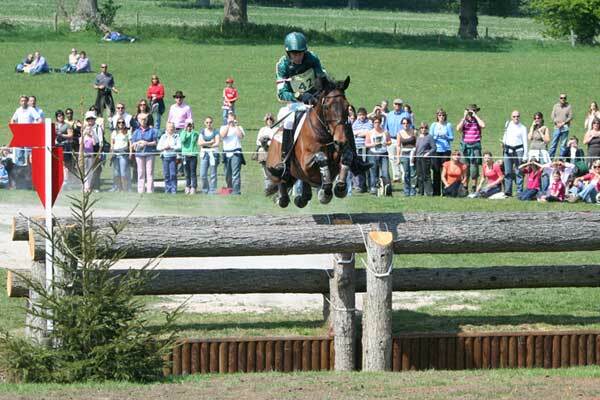 This fence has a lower landing which cannot be seen by the horse until he is about to jump it. Unlike a bank the lower ground is usually slopped to minimise impact on the horses legs and joints, when they land. 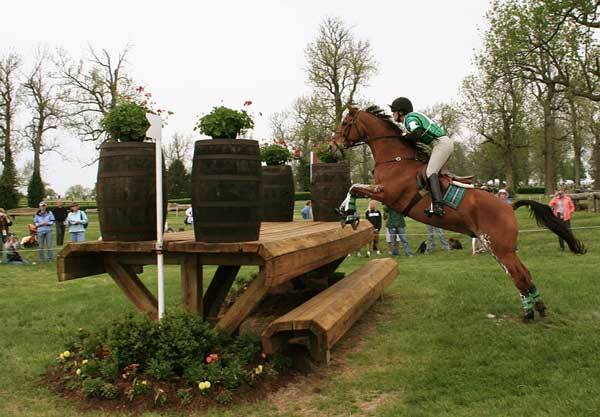 This is a very difficult fence and requires a lot of trust from the horse. The rider must take it slower with just enough power to clear it. The horse should be flatter and not arc over the fence. The rider should lean forward when taking off and then straighten up when the horse descends, giving the horse plenty of rein so that he can stretch his neck and keep his balance. Log Fence. These can be oxers, verticals, triple bars or log pile. Then only common element is that they are made of logs. Normandy Bank. This obstacle is usually only included in higher level competition. It includes a number of elements that test the horse and riders abilities. Firstly the horse must jump a ditch in front of a bank at the same time. Then there is another obstacle at the top and the horse then has to jump down a bank on the other side. Rolltop. 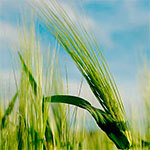 As the name implies it has a rounded half barrel appearance on top and can be quite wide. Skinny. This fence has a very narrow face and its difficulty is that it is easy for the horse to avoid. The rider must be extremely accurate and keep the horse completely straight. Stone Wall. These are solid jumps usually made of stone and they may have a log on top to make them higher. Sunken Road. This consists of a bank down jump, a couple of strides and a bank up jump. In the upper levels it becomes far more difficult with a rail jump before the bank down, one stride at the bottom before a bank up jump and another rail fence. Table. A table has height and width and is supposed to be jumped over. Some horse will jump onto the table and the jump down so the construction needs to be extremely strong to carry a horses weight. Trakehner. This obstacle consists of a rail fence over a ditch. Horses are usually frightened of ditches so it is a test of courage. Water. These obstacles can be either a simple crossing of a body of water, like a stream to a very demanding drop fence down into water, an island obstacle in the water as well as a jump up out of the water. 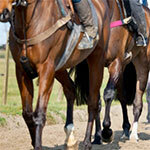 These competitions are usually held by Hunt Clubs, however Pony Clubs and Riding Clubs may also organise events. The specific rules for these events will be decided on by the organising group, which will publish them in the event schedule. Hunter Trials will always include a Cross Country section, which may be timed in full or in part. 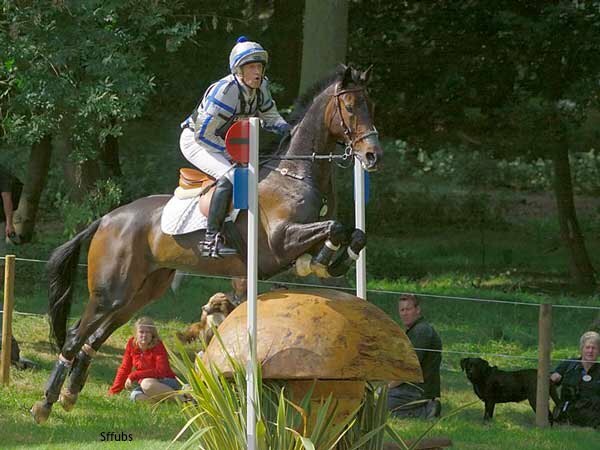 Some competitions include opening and closing gates, as well as Showjumping. 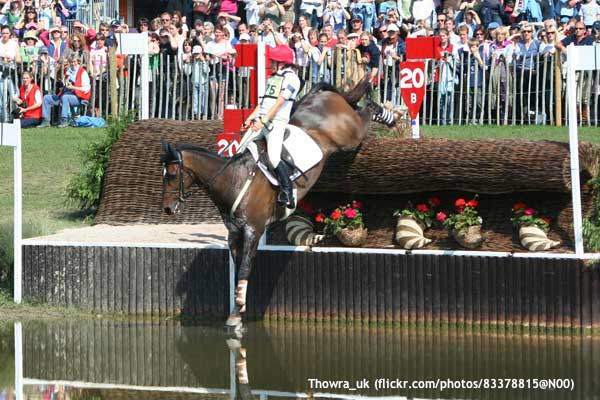 Take a walk around the Badminton course, watch some of the action from the 2008 Olympics, and more.